Ceramic pressure sensors typically use thick-film technology to create a low cost, stable, and robust media-compatible pressure sensor. These sensors are an excellent alternative to more expensive stainless steel pressure sensors or oil-filled sensors using silicon piezoresistive sensing elements for any application where an o-ring can be used. Why? Ceramic pressure sensors are capable for use in nearly all types of harsh media and high pressures. They can be easily packaged to meet your own housing requirements, and many configurations are available including unamplified or signal-conditioned, various calibration ranges. Low cost, single piece (monolithic) sensors come as gauge only. A smooth membrane is welded to the base to allow for absolute and sealed gauge snesors when that configuration may be required. Also available are ceramic capacitive sensors which have the abilility to measure low pressures such as 60 mbar but can tolerate high overpressures. For example, the ME550 can tolerate an overpressure of 2 bar. 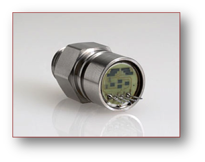 This advantage offers designers new possibilities for pressure measurement. As we previously said, using a ceramic pressure sensor requires the use of an o-ring which is straightforward and inexpensive. Standard models have 96% ceramic composition which takes care of many types of harsh media. For certain types of media, 99% ceramic composition can also be requested. For the ultimate protection, saphire composition is also available. However, since it is expensive, it is important to understand the nature of your media. Packaging these sensors can be customized for your application or through use of standard housing which is also available. See the image here which shows standard housing. 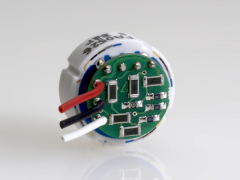 The sensor can be easily embedded in vales and pumps, opening the possibilities for better control in your application.